Rudolf Scheffel was born on 9 July 1914. In 1935, he transferred from the police force to the Luftwaffe to undergo flying training as a bomber pilot. Scheffel flew bomber missions with KG 76 during the French campaign and the Battle of Britain. However, in November 1941, Leutnant Scheffel transferred to 1./SKG 210, which operated the Bf 110 Zerstörer twin-engine fighter-bomber. On 24 September, with the unit now based on the Eastern front, he was appointed Staffelkapitän of 1./SKG 210. On 4 January 1942, 1./SKG 210 was redesignated 1./ZG 1. Scheffel led the unit in the performance of many effective ground support missions. So effective was the unit in this role that, on 12 July 1942, their air support resulted in the German army being able to encircle an attacking Russian infantry division. On 26 July, Scheffel was shot down in Bf 110 F-4 (W.Nr. 2688) “S9 + CH” and badly wounded by flak. Leutnant Scheffel was awarded the Ritterkreuz on 29 October for five victories. In October 1943, Scheffel, now flying Reichsverteidigung missions with I./ZG 26, was again wounded. On 17 February 1944, he returned to ZG 26 in a staff role. He was later appointed Geschwader Adjutant of ZG 26. On 1 August 1944, ZG 26 was redesignated JG 6. On 1 February 1945, Scheffel was transferred to the Schießschule Vaerlöse in an instructional role. Scheffel survived the war but died on 18 December 1983 at Mönchengladbach. 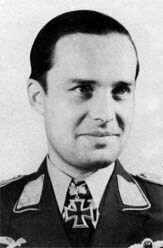 Rudolf Scheffel was credited with seven victories in 259 missions, including 99 bombing missions. He recorded five victories over the Eastern front. In addition, he is credited with destroying 50 tanks.